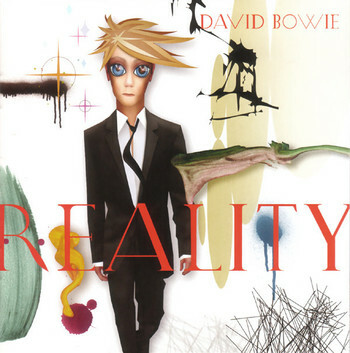 "See the great white scar, over Battery Park"
Reality is the twenty-fourth studio album by David Bowie, released in 2003 and the second album produced since the reunion of Bowie with longtime collaborator Tony Visconti. More straight-forward alternative rock compared to its predecessor Heathen, it was followed by A Reality Tour. It was the highest grossing tour of 2004, gaining more than 700,000 attendees and a DVD release in 2010. However, Bowie suffered an eye injury from a lollipop being thrown at a concert in Oslo, only to be followed a week later by a heart attack while performing at a festival in Germany. It would be his last major concert. The events led to a long break, during which time Bowie would become more involved with raising his young daughter, save for the occasional guest vocals, acting role or assistance with music production. For nearly ten years Reality was considered his last album, until an unexpected comeback in 2013 occurred with The Next Day. The singles released from the album were "New Killer Star" and "Never Get Old". "Dead or alive, bring me the disco tropes"
Animesque: The anime-influenced cover art of the album was created by Rex Ray, an American graphic designer. Artistic License  Biology: "Pablo Picasso" with the line "The girls would turn the colour of a juicy avocado". Awful Wedded Life: Implied by both "She'll Drive the Big Car" and the Gender Flipped B-side "Fly". Cover Version: "Pablo Picasso" by The Modern Lovers and "Try Some, Buy Some" by George Harrison. During this period he also released "Love Missile F1-11" (Sigue Sigue Sputnik) as a b-side for "New Killer Star". Epic Rocking: "Bring Me the Disco King"
Limited Lyrics Song: "The Loneliest Guy"
Mondegreen: Invoked with "New Killer Star", which is written and pronounced to make fun of the way George W. Bush pronounced the word "nuclear"
"Never Get Old" was remixed with "Rebel Rebel" from Diamond Dogs and released as a single as "Rebel Never Gets Old"
"Bring Me the Disco King" was intended to be released on Black Tie, White Noise but ended up being reworked twice, first unsuccessfully for Earthling and then successfully for this album. Record Producer: David Bowie and Tony Visconti. Sharp-Dressed Man: Bowie in the pose that inspired the cover for the album . Stealth Pun: What better way to promote an album titled Reality than with a cartoon drawing of your likeness. Take That! : to the Bush/Cheney Administration through the songs "New Killer Star" and "Fall Dog Bombs the Moon"
Word Salad Title: "Fall Dog Bombs the Moon".